I wasn’t sure if I was the right audience for this book, as I’m not contemplating homeschooling, or unschooling, children. But I still found it fascinating, as an account of a homesteading family, a unique look at parenting, and a chronicle of the life of a writer. Ben and his wife Penny buy land in Vermont, surrounded by dairy farms, build a small cabin, later add a basement and an addition, and welcome two boys into their life. Ben writes magazine articles and non-fiction books, and the family runs a small farm. The boys are self-directed learners, not following a set curriculum, and are very creative and productive, more interested in exploring the woods, raising dairy goats, and learning wilderness skills than in sitting down and reading textbooks. Yes, the boys are learning basic academic skills including science and history, but only when it’s connected to one of their interests. Finn and Rye also have daily and weekly chores on the farm, weekly music lessons and occasional tutors to learn particular craft and wilderness skills. 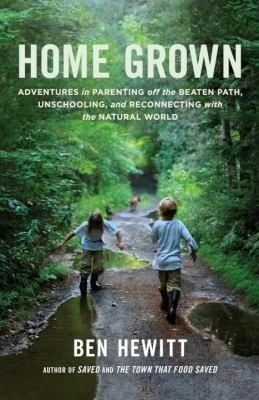 Since this book was published in early September and has been publicized on public radio and elsewhere, the Hewitts are getting many questions about how to encourage creativity in children and also comments criticizing the boys’ non-standardized education. This is an absorbing read in how some children learn when they are free to explore their interests. For more about the Hewitts, check out Ben’s blog.